Yesterday I bought apples and honey for the Jewish New Year. 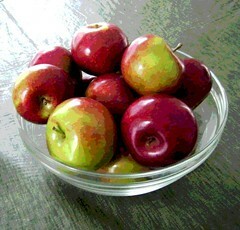 I put some of the apples in a glass bowl, and was admiring them, so I took some photos. I cropped one of the photos to get this composition, and then used Painter IX to posterize it. Just apples in a glass bowl on a vinyl tablecloth, but I think it works. In art as in life, sometimes the simplest things are the best. This image began with a photograph that I took a few weeks ago during a walk at Long Hill Gardens here in Beverly. 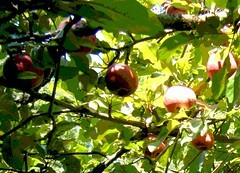 The main road is lined with fruit trees, mainly apple and crabapple. I saw the bright red apples on this tree, and started taking pictures. I remember thinking at the time that the photos might work for Rosh Hoshana (Jewish New Year), when we dip apples in honey to reaffirm that life is sweet. The composition of this shot captures the sense of being right up under the tree, which I was. I posterized the image in Painter IX to emphasize the play of the dappled light. Getting a good image is complicated by the fact that some of the apples are in full sun and some are in deep shadow. On the other hand, I like the metaphoric possibilities: apples, and the sweetness of life, sunlight and shadows. Today I realized that I have been periodically staring out the back door at a tree that has gone bright orange, less than a block away. 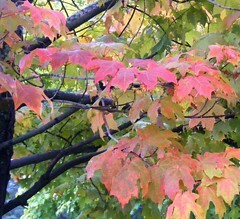 Then I also realized that somehow it has gotten to be fall without my noticing! Maybe it was the events of last week, or too much time spent working, or perhaps the rain we have had for days and days. But in any case, I believe that we are supposed to notice the beauty in this world! So I put on my raincoat, put my digital camera in my pocket, and set out for a short walk around the block. It was still drizzling, but not raining hard. I took pictures of two trees, both on the margins of a parking lot. But never mind, they are beautiful trees, the colors are amazing, and if you look closely, you can see raindrops on the leaves. After my little one block expedition, I went inside, transferred the photos to my computer, and started editing. I cropped this image from one of the best photos. I noticed a few distracting holes or marks on a leaf or two, so I opened the image in Painter IX and did just a tiny bit of repair work with digital pastel. Yesterday I finally got back to the studio and had a chance to work on this project for a while. The heart-shaped box once contained a Mother's Day gift from my daughter. 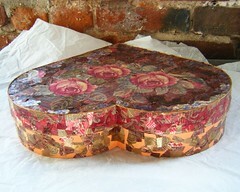 Now I am covering it with collage and decoupage patterns cut from printed metallic ribbons. Yesterday, I kept going on the gold areas on the outside of the box, as well as the red patterns on the inside. It felt good to be working on this. About ten days ago, I used the top of this heart shaped box (photo posted here June 4th) as the image for a very early e-mail Valentine to a favorite aunt. Well, mid-September is very early to send a Valentine, but actually I sent it just in time. (She passed away a few days later.) So I'm glad I sent it when I did, and I say, it's always the right time to send a Valentine. Two weeks ago, I tagged along to a weekend conference in Lake Placid, New York. The first stop on this little road trip was the University of New Hampshire in Durham. I had an hour to kill before we got back on the road, so I took a little walk on campus. The university is in a beautiful woodland setting. (When I took this photo, I was standing on a path less than five minutes walk from a classroom building. 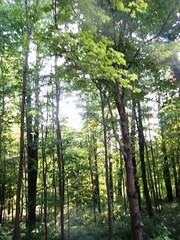 But it was easy to forget that, looking up at the trees!) The morning light was beautiful so I took some photographs. In this one, I tilted the camera upward a little to try to capture the height of the trees, and got some interesting refracted light as a result. What I was after was the sense of peace that I had when I looked at the morning sun on the trees. I used my Painter IX program to posterize the photo that I posted here yesterday. I took the original photo last week, during a walk at Lynch Park, here in Beverly, Massachusetts. 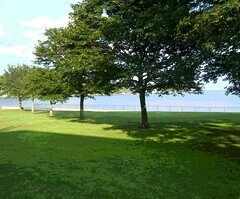 Lynch Park is our city park, just like any other, except it has ocean on three sides! This is a view of the small cove, off to one side, where the waves are very gentle. One of the pleasure of September is walking on the beach, especially for dog lovers. (Here in Beverly, MA, dogs aren't allowed on the beach between Memorial Day and Labor Day.) I took this photo during a recent walk at Lynch Park, a little city park that is surrounded by ocean on three sides! This photo was taken at a small cove in the park where the waves are very gentle. It is great to get close enough to really see the water and watch it move. 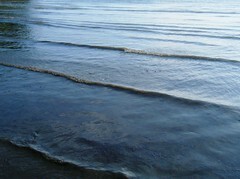 I cropped this image out of the original photo to focus on the patterns created by the light and the water. I took this photo last week during an early evening trip to Woodman's. During the summer, long lines of tourists surround the place, lining up for New England seafood. After labor day, Woodman's is easier. It's a great place to go with a dog because there are picnic tables out back, and the view is wonderful. I enjoyed eating the hot corn on the cob in the evening air. 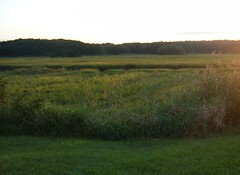 The evening light looked beautiful on the salt marsh, so I took a few pictures. Here is one of the photos, cropped just a bit to improve the composition. Yesterday I had a chance to work on this project for a little while, up at the studio. The heart-shaped box once held a Mother's Day gift from my daughter. 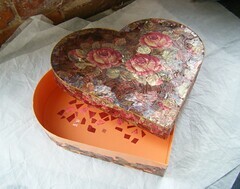 Now I am using printed metallic ribbons to create decoupage and collage patterns on every surface. I am working on two areas at once: the outside of the box (lower part), which I am covering with predominantly gold patterns, and the bottom of the interior of the box, which is going to be predominantly red patterns. I decided to work on both areas at once because I am using some ribbon that has lots of gold and bright red in it. I used Painter IX software to posterized the image that I published here yesterday: a photograph of a line of trees at Dane Street Beach. I took the photo a few weeks ago, in Beverly, Massachusetts. The posterizing has the effect of heightening subtle differences in color and value, and in this case, emphasizes the dappled light under the trees. This is a view of the trees in the park at Dane Street Beach here in Beverly, Massachusetts. I took this photograph during an afternoon walk with the dog several weeks ago. It was close to Labor Day (August 25th to be exact), but there were still a few days to go, so we stayed on the sidewalk. (In Beverly, dogs aren't allowed on the beaches between Memorial Day and Labor Day.) It was the row of trees leading toward the water that made me want to take the picture. Tonight I cropped the photo to emphasize the diagonals of the trees, the shadows, and the lines of the shore. I also created a posterized version, to be posted tomorrow. 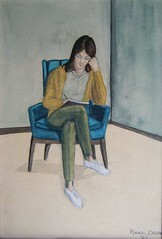 I did this watercolor back in 1965, when I was still in high school. (It is signed with my maiden name, Randi Zagon.) I painted my cousin while she was studying. This painting has been hanging on my aunt's wall for years, and I see it whenever I visit Colorado. On my most recent trip to Denver, which was in August, I had my digital camera with me, so I decided to photograph this little watercolor so I would have an image of it. Here is a photo that I took several weeks ago (August 21) during a summer walk here in Beverly, Massachusetts. (This is the photo just as it came out of the camera, apart from some gentle cropping.) 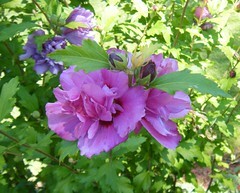 There were pink rose of Sharon shrubs growing in my yard back in Lawrence, Kansas, and they always brings back happy memories for me. The rose of Sharon is an optimistic flower, blooming just when you think it is too dry, too hot, or too late in the summer for anything to blossom. This morning I went to the studio to work on this project. A few years ago, my daughter gave me a present for Mother's Day, and it came in a heart-shaped box. 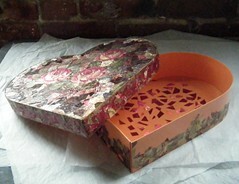 I kept the box, and now I am covering it with decoupage and collage patterns cut from printed metallic ribbons. I have been concentrating on the gold area around the outside of the box, but today I decided to start working on the inside of the box at the same time. I am going to make the bottom of the box (the inside, that is) predominantly red, the most saturated colors that I can find in these ribbons. The ribbon patterns with intense red colors also have a lot of gold in them, so it makes sense to work on both gold and red areas at the same time as I cut into those bright ribbons. Besides, it will be more fun to do it this way, and having fun is important, because this work is time-consuming. I guess there is still time for one last look at Lake Placid. I used Painter IX software to posterize the image that I posted here yesterday; I also cropped it just a little bit more. I should probably apologize for the repetition. After all, this is the fourth version of this photo! Still I am glad I kept going, because I like this version the best. Well, Gertrude Stein always said that there is no such thing as repetition, only insistence. So I am posting this for anyone who needs a little bit more peace, a little more beauty, a little more joy to get through the day (today or any other day). 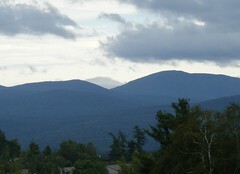 This is a closer crop of the image I posted two days ago, a view of the Adirondack Mountains seen from a hotel terrace in Lake Placid. When photographing a scenic view, my impulse is often to photograph the widest possible view. But I have learned that it is usually more effective to crop out a small part of the scene. The tighter the crop, the better the result, and the paradox is that somehow the cropped version often conveys a better sense of the scene. 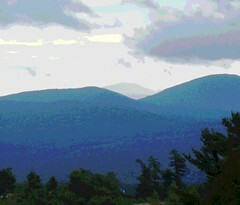 I am in no hurry to leave the peace of Lake Placid. So in the face of the turbulence of the current election, and the memories of September 11, 2001, tomorrow I will post just one more peaceful view of Lake Placid, the posterized version of this image. Then it will be time to move on. I used Painter IX to posterize the photo that I published here yesterday, a view of the Adirondack Mountains from the terrace of the hotel in Lake Placid. In addition to posterizing the image, I also adjusted the contrast and brightness. I like this version, but after I thought I was finished working with it, I decided that cropping the image even more might yield a better result. So I tried it. To be continued. . . I spent last weekend in Lake Placid, New York. One of the advantages that I had in tagging along to a conference (as opposed to attending it) was time to make art. I did a little painting, I made some jewelry in the local bead shop, but most of all, I took lots of photographs. Tonight I transferred them all into my computer. I haven't edited them yet, but I quickly looked for the the view that inspired the watercolor postcards posted here September 5, 6, and 7. 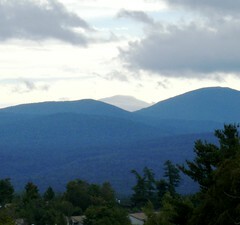 So tonight I am posting an image that I cropped from one of those photos, a view of the Adirondack Mountains seen from the hotel terrace. 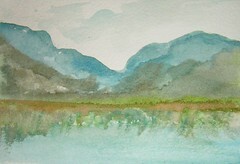 This is the third of three little watercolors that I did this weekend in Lake Placid, New York. All three are views from the hotel, the Adirondack Mountains and Mirror Lake. I painted at a table on the hotel patio, using my portable watercolor kit and watercolor postcard paper. 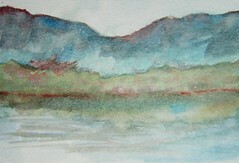 This is the second of three watercolor paintings that I did this weekend while I was in Lake Placid, New York. The view from the hotel was amazing, and you could watch the light play on the mountains above Mirror Lake. I sat on the hotel terrace to paint, using my tiny travel watercolor kit on watercolor postcard paper. 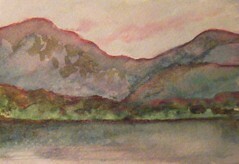 I gave this painting a pink cast because I was remembering the way the mountains had looked that morning. I spent the weekend in Lake Placid, New York. (I tagged along to a conference, lured by the prospect of a beautiful fall drive on the way and plenty of mountain scenery.) The hotel was up on a hill with a beautiful view of Mirror Lake. I sat on the patio of the hotel and painting three small watercolors. I had packed my travel watercolor set, but the only paper I had left was watercolor postcard paper, hence the title. This is the first of the three paintings. 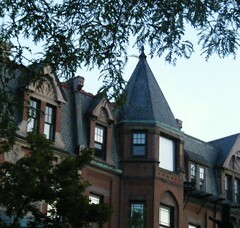 This is a posterized version of the photo I posted here yesterday: a view of the buildings on Newbury Street in Boston. I took the photograph from a French restaurant while sitting at one of the outdoor tables. I liked the way the buildings looked, and the way the windows reflected the evening sky. Last night I used Painter IX softwear to posterize the image. Sometimes, as in this image, posterizing a photograph can bring out textures and patterns that might otherwise be overlooked. Last week's run into Boston included dinner on Newbury Street, at a little French restaurant with sidewalk seating. For me, it is always a treat to be on Newbury Street, with its beautiful buildings, interesting shops, and lively crowds, strolling along to see and be seen. So this was a "dinner with show". The weather was perfect and the evening light was fantastic, so I took a few quick photos, without even getting up from the table. This image is from one of the best of them, cropped to focus on the shapes and textures of the tree and the building behind it. I also tried posterizing this photo, and I will post the result tomorrow. This morning I went to the studio for a bit and worked on this decoupage and collage project. The heart shaped box originally held a Mother's Day gift from my daughter. 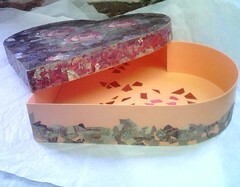 I saved the box and now I am covering it with patterns cut from printed metallic ribbons. I am currently working on the outside of the box, which I am covering with predominantly gold tones. Finding enough gold pattern is a bit of a challenge, but I think I will get there. This is slow going, but I don't mind. Working on this is almost like a meditation, reminding me that problems can be solved with small steps. Even when the end result is uncertain, what matters is to take the steps you can. 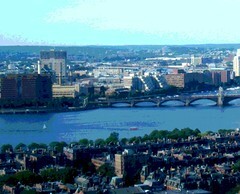 Yesterday I posted a photo of the Charles River that I took during a trip into Boston last Thursday. (A friend who was visiting Boston had a hotel room with a spectacular view from the thirty-fifth floor.) The post for today is the same photograph, but this time posterized using Painter IX. This photo is proof that is a good thing to have friends in high places.